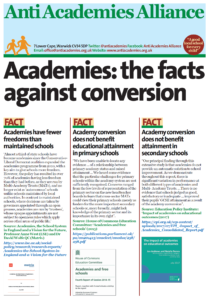 Anti Academies Alliance Newsletter: 18 November 2013 – Profits for parents? Share the link – encourage other individuals and groups to participate. Meanwhile a teacher at Falconwood Academy in South London – part of Mr Gove’s favoured Harris chain – has been caught cheating; rewriting science coursework. This follows earlier unrelated investigations into science and other subjects at neighbouring Harris academies. 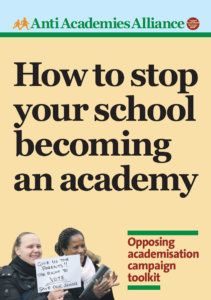 Free Schools: Free to ignore the equality act? Free to fiddle the funds? Rather than criticise free school founders facing a fraud investigation, Michael Gove has hailed them as idealists. It’s taken the DfE six months to launch an enquiry even though Kings Science Academy is accused of making unsubstantiated payments and nepotism. 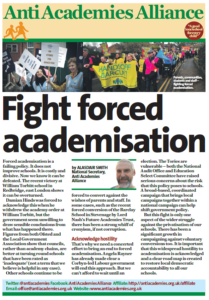 This entry was posted in Blog, News, Top story and tagged Forced academisation, Free Schools, Gove, Rejecting Academy. Bookmark the permalink.